Mike hired an Okie. 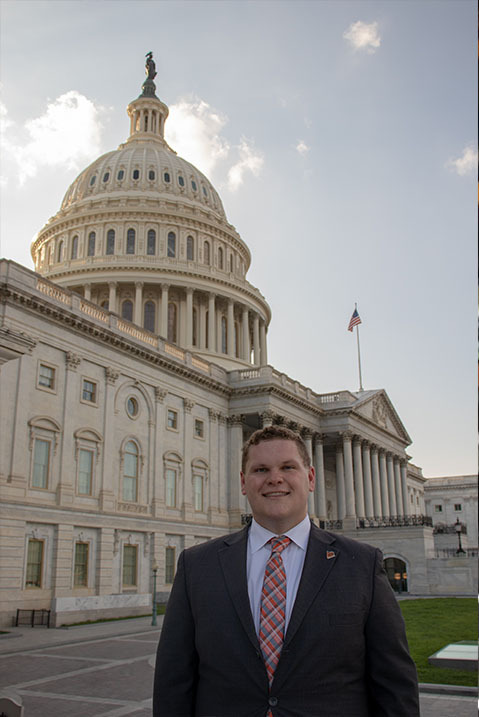 Now that we’ve got that out of the way, I’m Mason Martin, a rising senior at Oklahoma State University, studying agribusiness and agricultural communications. I’m a big time Cowboys fan, food-lover and am interested in agricultural literacy, communication and policy. My time with MTA has been a major eye-opener. Coming 1400 miles from home to an internship where I knew very little about, I was understandably nervous, yet excited to learn about Washington, D.C. and experience agricultural policy (in a Farm Bill year no less) first hand. When I got here, I quickly found that I had landed myself in a team of wonderful, impactful agricultural professionals who made my time in the Beltway an absolute blast. The staff at MTA is a fantastic team. From our positive focus on Mondays, coffee breaks and countless meetings, there is a true friendship developed between the staff and an unsurpassed level of teamwork. From the very first day, I was included in meetings, calls and lunches so I could learn about our clients needs and wants. It didn’t stop at just work though! Whether it was a happy hour recommendation, restaurant I HAD to try, people I should meet, or best way to metro somewhere, everyone was focused on helping me have a great time. I neverfelt like just the intern, I was a part of Team Torrey. I was immediately aware of the work MTA puts in daily. Whether it’s a client fly-in, Hill meeting, webinar, call, or briefing, the team goes nonstop. Everyone is thankful for Friday when we get to wrap up and decompress, but during the week, every 30 minutes is a new task, and they take it in stride. The fast-paced work environment was energizing and draining at the same time, but always an adventure. I repeatedly found myself living the phrase “I don’t even know what I don’t know,” in all the best ways. I was constantly engaged and learned more everyday about how policy works, how Congress moves, the history of agricultural policy, and so much more. Any question I had, there was an open door policy. Sometimes my questions would turn into research projects, as was the case with conference committee processes, so we would have information on hand to send to clients in case they were curious like myself. When people ask where you’re interning and you say MTA, you get to hear lots of good stories. Whether it’s a throwback to when Mike was working for Bob Dole, Tara at Senate Ag, or more, Team Torrey has left a legacy of good friendships and help all across town, and it was awesome to meet so many people who were happy to talk about the great people at MTA. My next few steps are uncertain as I return to OSU to finish up my senior year. I’ll be looking at a lot of options on what to do next, be it law school, grad school, finding a job, or giving in to the Potomac Fever and coming back to D.C. One thing is for sure though: while I was nervous to come to town, I’m now sad to leave. I’m so glad to have met and learned from the people here at Michael Torrey Associates. I learned more, did more and had more fun than I could’ve anticipated, and am so excited to have Team Torrey as a group of professional mentors and friends as I leave my internship. © 2017. Michael Torrey Associates, LLC — All rights reserved.